1. In a deep-sided frying pan, place the sake, celery, carrot, onion, 1 tablespoon of sugar, bay leaves, peppercorns and soy sauce. 2. Season the salmon with salt and white pepper and add to the sake. Pour in enough water to cover the salmon. 3. Slowly, over a low heat, bring the liquid to a simmer. Simmer the salmon for 3 minutes then turn off the heat. Let the salmon stand in the poaching liquid for 2-5 minutes, then remove with a slotted spoon. 4. Meanwhile, using a blender, make a vinaigrette by blending together the shallots, lime juice, lemon juice, orange juice, Japanese soy sauce and remaining sugar until smooth. Add the olive oil and season with salt and white pepper. 5. 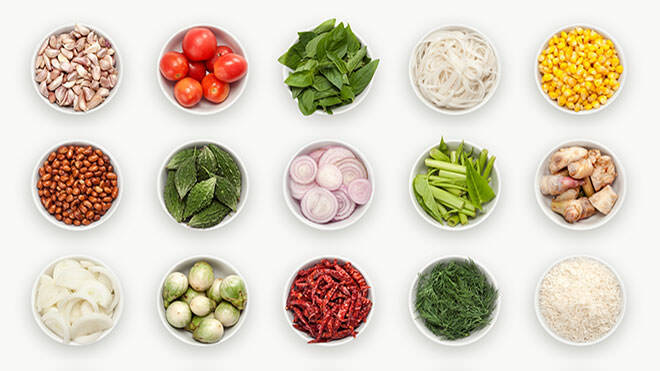 In a large salad bowl toss together the fennel, somen noodles and spring onions and toss with the shallot vinaigrette, reserving some for ganish. 6. Serve the poached salmon with the noodle salad and roasted plum tomatoes, drizzling the remaining vinaigrette over the dish just before serving and garnishing with the reserved fennel tops.